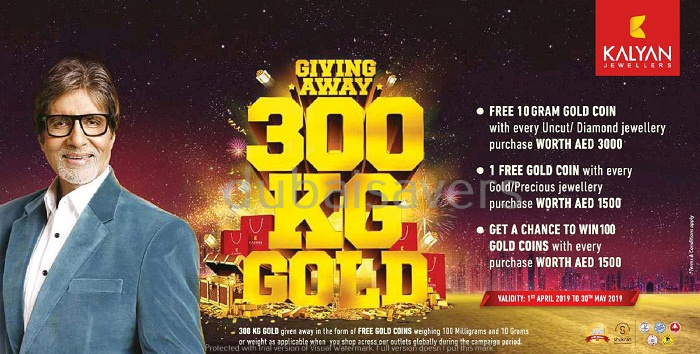 Kalyan Jewellers is giving away 300kg gold in the form of FREE GOLD COINS when you shop across outlets during the campaign period. Get 10 gm GOLD COIN FREE on every purchase of diamond & uncut jewellery worth AED 3,000. Get 1 GOLD COIN FREE on every purchase of gold & precious jewellery worth AED 1,500. Get a chance to win 100 gold coins with every purchase worth AED 1,500. View related image for more details. The group derives its origins from textile retailing and wholesaling and has experience of over 100 years in the trade. Kalyan Jewellers branched out into the field of jewellery retailing in the … see more..